I love yogurt all ways – made up sweet in a smoothie with fruit, savory with seeds and herbs, as a topping on meals or a spread on sandwiches, as a supplement to swig down doses of flax oil and molasses… the list goes on. It has always been an important dietary staple in our home, and the benefits of eating cultured dairy are many. My only qualm, in past years, was with the countless plastic quart containers that accumulated with our yogurt consumption. I don’t know how it took me as long as it did to discover how easy it was to make yogurt myself. It’s really, really easy! 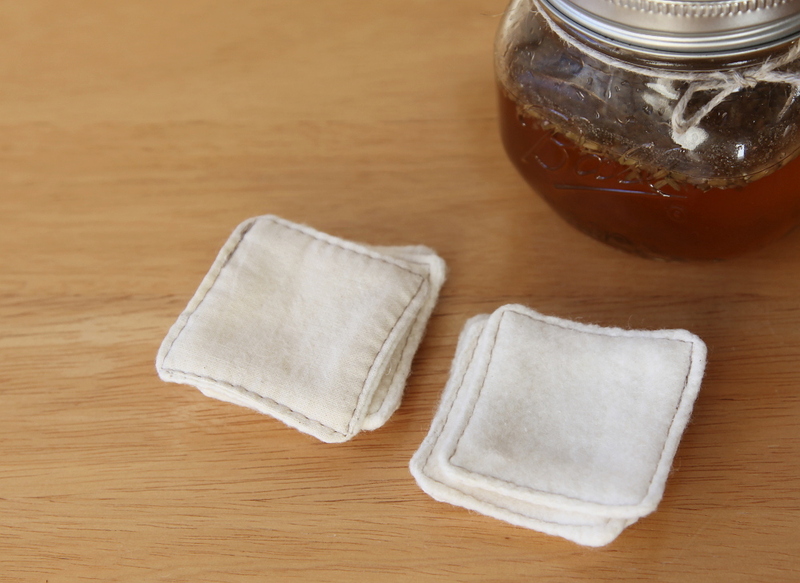 There are many yogurt tutorials out there, I am sure, but we all do things a little differently so I thought I would share my method. Now that I’ve developed a rhythm, I find the process to be so easy I can do it almost without thinking. While it takes many hours from start to completion, the actual time required of you to be in the kitchen is maybe 10 minutes, as most of the time is simply letting your yogurt do it’s thing. I make one gallon of yogurt at a time, but you can make any amount that works for your household. 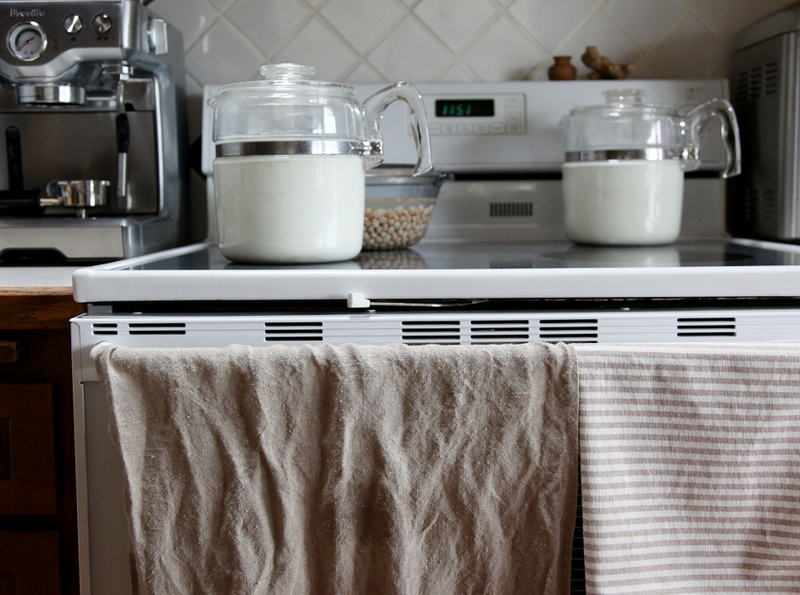 I like to make the most of my yogurt-making sessions, and typically we (mostly I!) consume about a gallon of yogurt every 2 weeks. A few notes: You will need as much milk as the amount of yogurt you want to produce. For example, to make a gallon of yogurt you need a gallon of milk. I use Organic Valley Whole Milk. I wouldn’t recommend using skim, but a lower fat milk should work fine. You will need about 2 Tbs of yogurt per quart of milk. 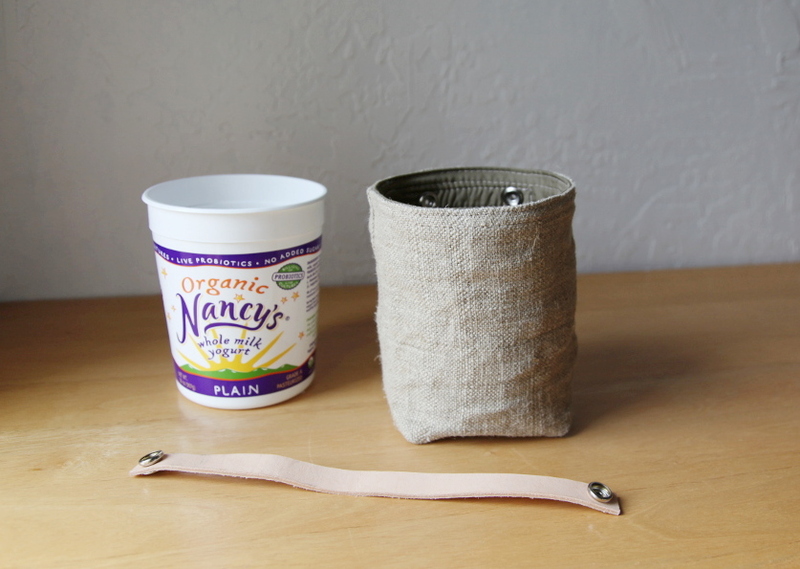 I use Nancy’s organic whole milk yogurt. 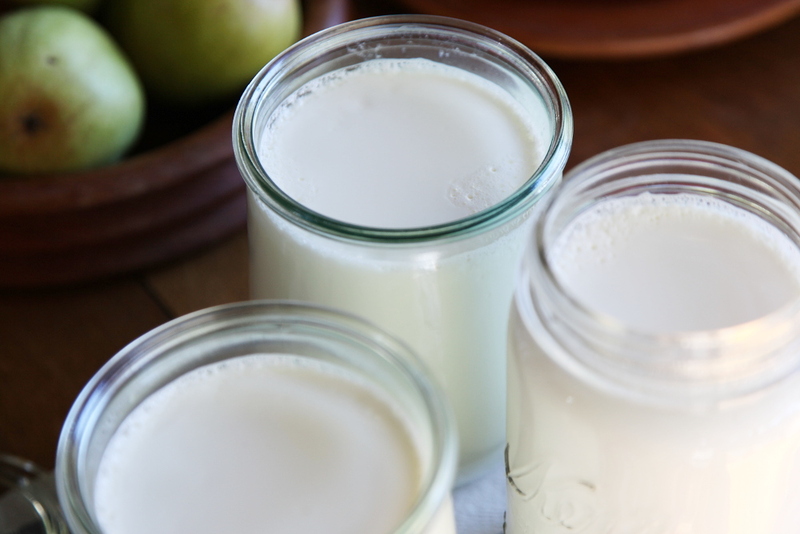 You will need enough storage jars to accommodate the full quantity of milk, plus a small amount of extra (equal to the quantity of yogurt starter you use). 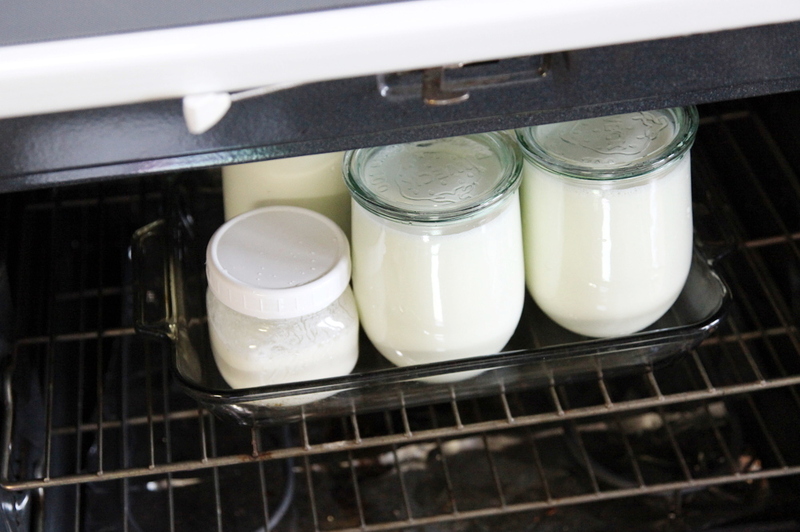 The short… heat milk, cool milk, mix in yogurt starter, pour into containers, incubate, refrigerate. 1. 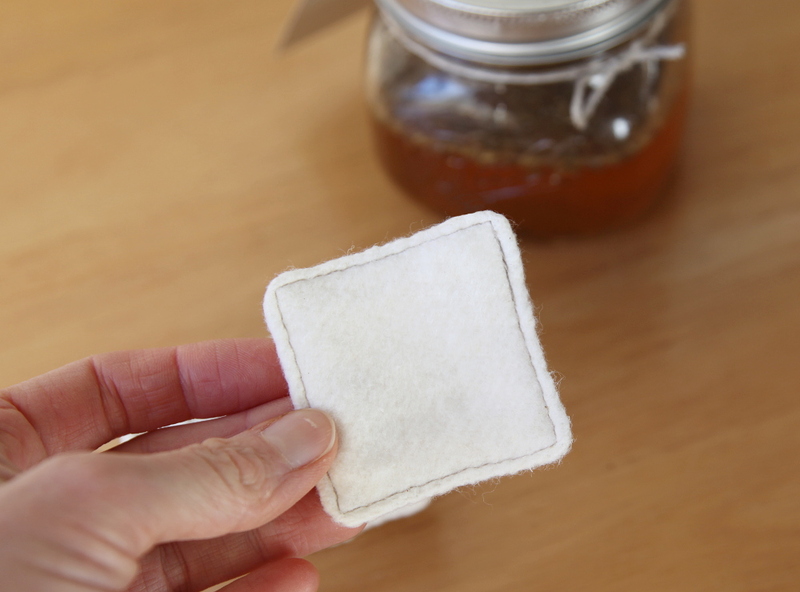 Clean all of your materials thoroughly (pots, jars, stirrers, etc). 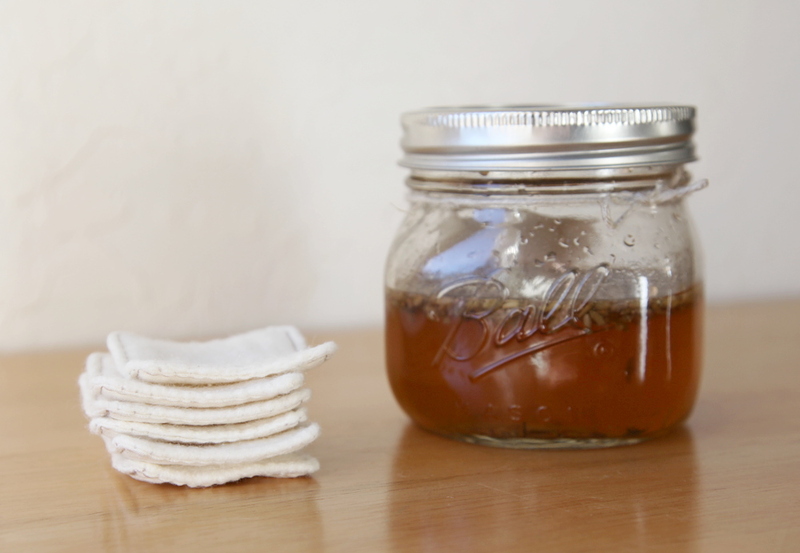 Since we are dealing with fermentation, and are attempting to cultivate healthy bacteria – not unhealthy bacteria – cleanliness is very important, and is the easiest way to insure success. 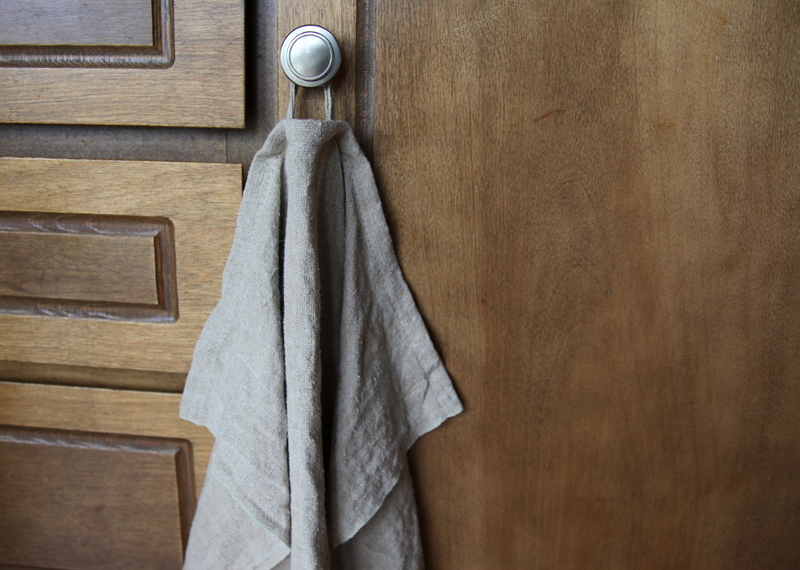 You can use the sanitization method of your choice. 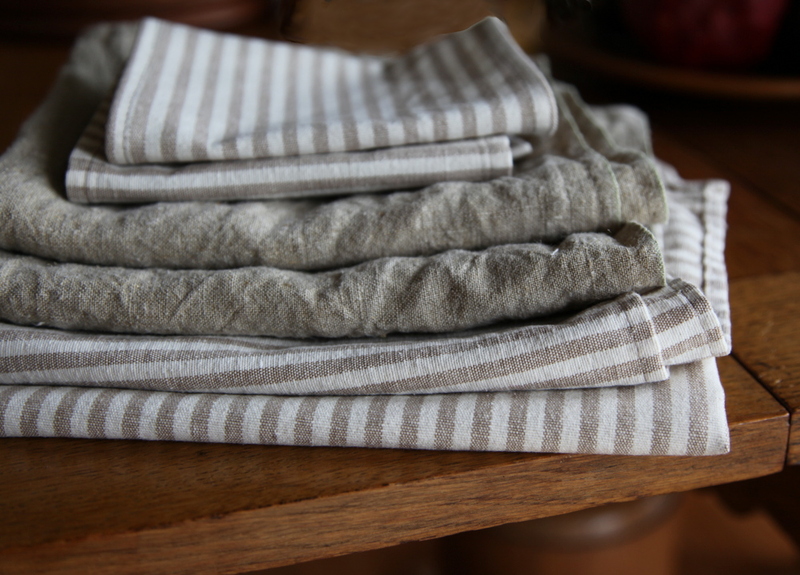 I scrub everything thoroughly, rinse with very hot water, and then do a final rinse with purified water and drip dry (this isn’t “sanitization” per se, but it works well for me). 2. Pour your milk into your cook pot/s and heat to 170-175 degrees, stirring occasionally. I set my stove to a medium low temperature and let it heat slowly, so that if I get distracted it’s unlikely I will burn the milk. I have accidentally allowed it to reach 190 or so without burning, due to the slowness of the temperature rise. You don’t want to burn your milk! It will taste yucky. 3. Once your milk has reached temperature, take it off the heat, stirring for a minute or so to avoid scalding on the bottom. Now let it cool, down to about 110-115 degrees. This will take some time, so you can go on to do other things for a while. (Heating the milk is a precautionary measure, to kill any unwanted bacteria that may compete with the bacteria you are trying to grow to make your yogurt. Cooling the milk is important so you do not kill your starter). 4. When the milk has cooled to 110-115, pour a small amount of it into one of your jars, and mix with the appropriate amount of yogurt starter per the quantity of milk in the pot you drew from. Stir the small mixture until the yogurt is dissolved, and then pour it back into your pot of milk. Now mix it in so that it’s well dispersed throughout the pot of milk. 5. 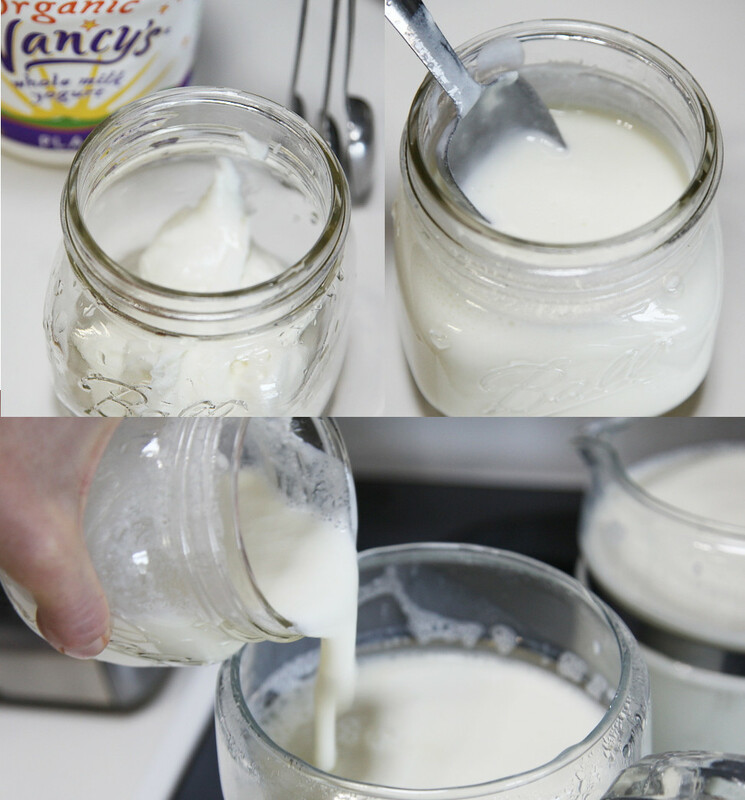 Pour your yogurt milk into jars, lid them loosely, and now it’s time to ferment. 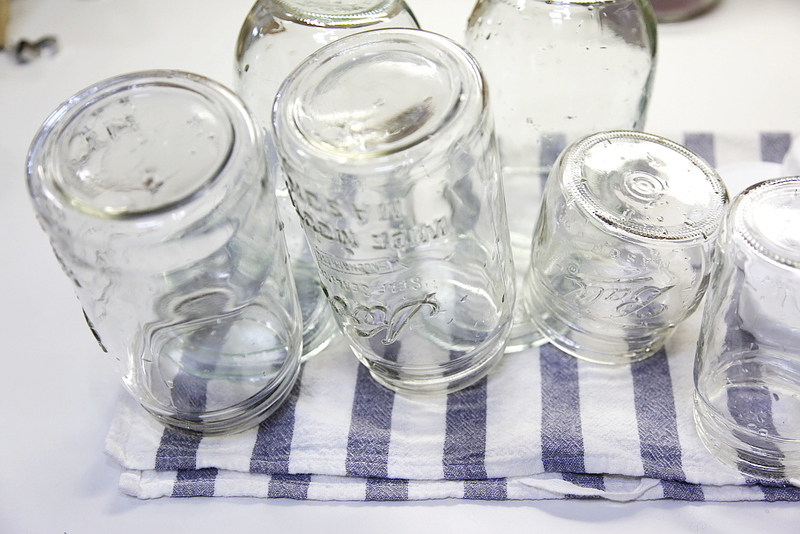 For the incubation period, I set all of my jars on a heavy glass bake pan and place it in the oven. * I heat the oven to 100 degrees and then promptly turn it off. Every few hours, I turn the oven heat back on (a minute or less, set at the lowest temperature possible) and then turn it back off. I usually leave my yogurt to ferment for 12-18 hours (this is relatively long, so you may like to experiment with different fermentation times). *Note about using an oven: My oven doesn’t maintain a temperature lower than 170 degrees. It has a digital readout though, that tells me what temperature it is inside so I can monitor the rise and turn it off at the appropriate time. I have a rule for myself that I CAN NOT multi task while waiting for it to heat. It is too easy to get distracted. I have nearly cooked/killed my yogurt before. Take care not overheat and kill your yogurt. 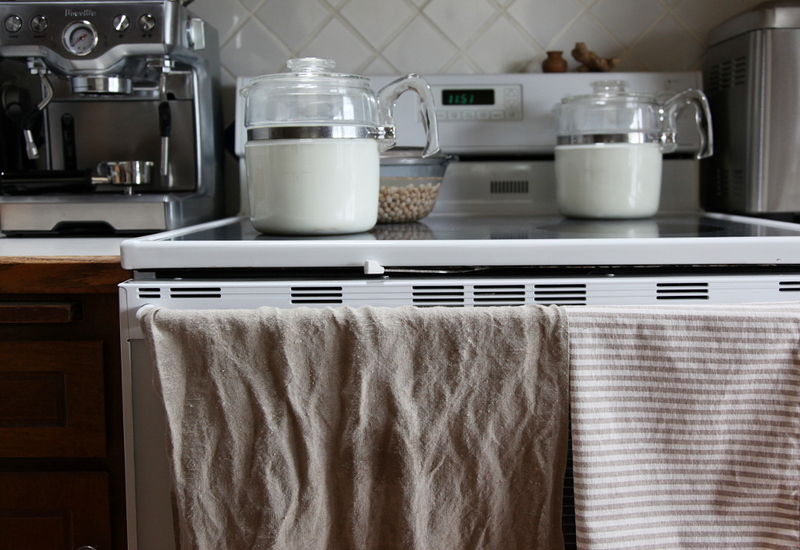 If your oven can maintain a heat of 100 degrees on it’s own, you have the perfect yogurt maker!! If you do not have a digital readout, a minute or less of heat is plenty. 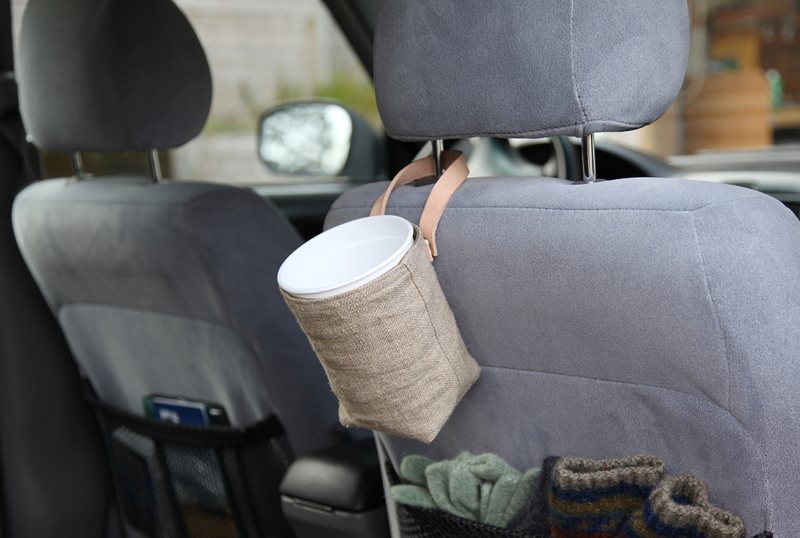 You are simply providing assistance in the fermentation process by creating a warm environment. 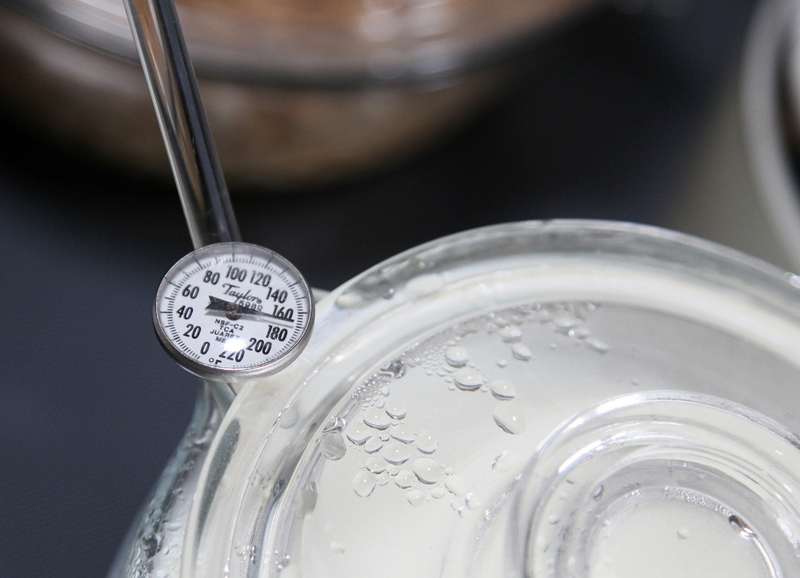 I aim for around 100 degrees for yogurt fermentation, though lower temperatures will work as well. It will just take a little longer. 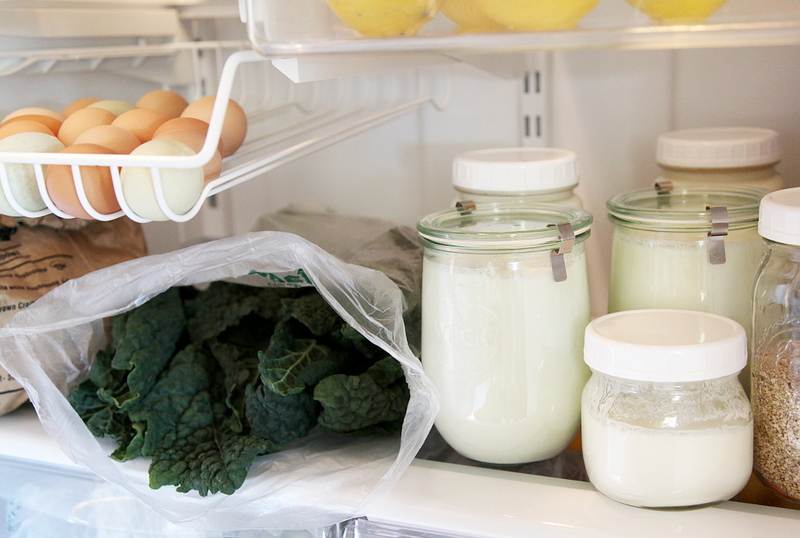 When your yogurt is finished, seal your containers snugly and store them in the fridge. I find it really satisfying to put away a gallon of fresh yogurt! Your yogurt will have firmed up quite a lot – something like creamy pudding – and will firm up a little more once it refrigerates. It should have that pleasant, slightly sour/sweet smell. 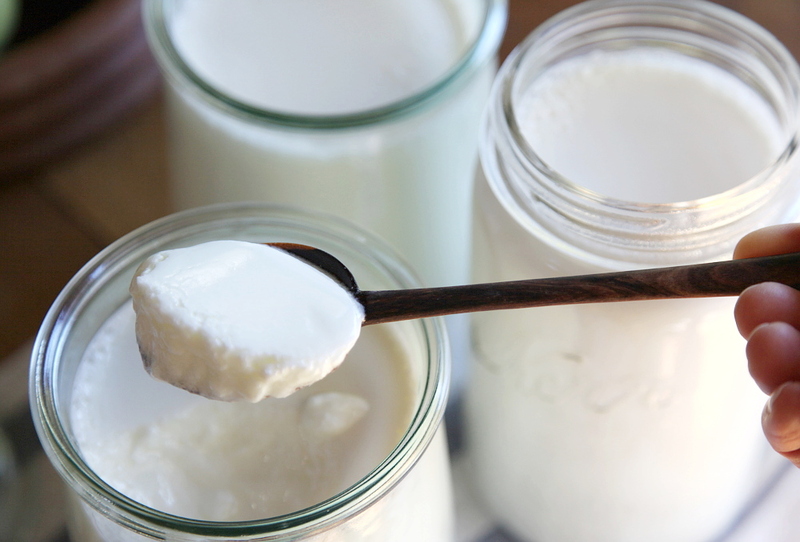 Home made yogurt is not as thick as store bought (in my experience), but the thickness will depend quite a bit on how long you ferment for – firming up more (as well as becoming more tart), with longer fermentation time. 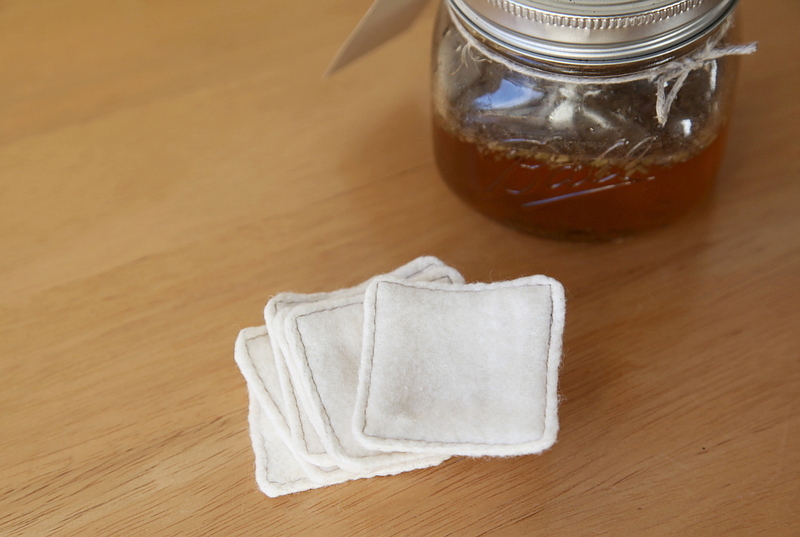 Now that you have your own yogurt made, you can use it as your starter for the next batch. I have read that if you are using your own starter, it should be no more than 2 weeks old, and if it is older than that to start with a new starter again, though I haven’t verified how important this actually is. I usually use my own starter 2 or 3 times, and then start with a new one again. 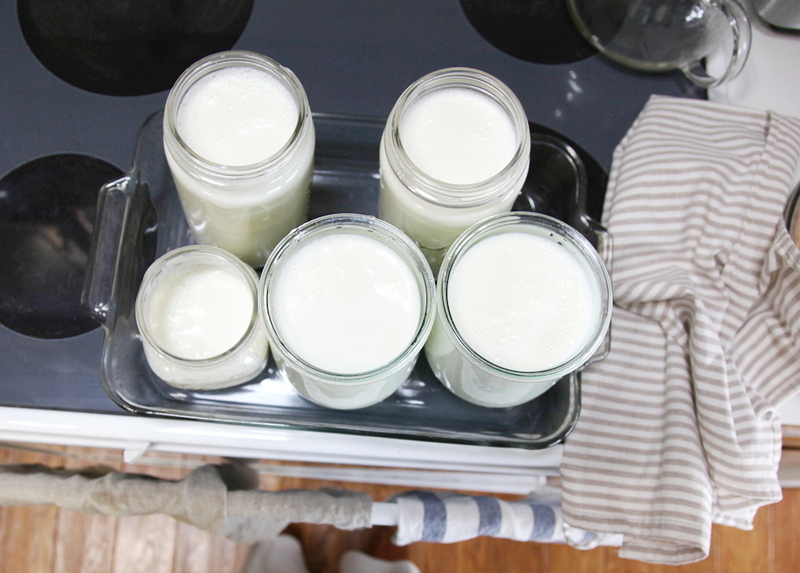 If you have never made yogurt before, I hope you try it! Feel free to ask any questions you might have. 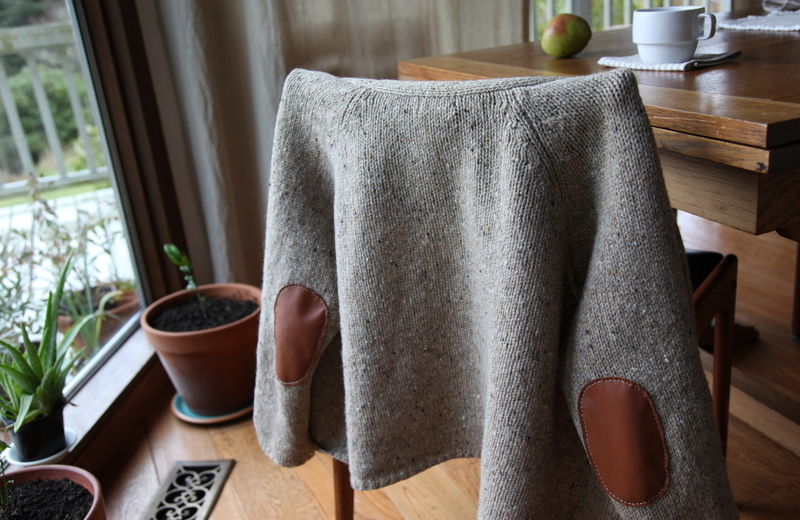 This week I repaired an old favorite sweater. 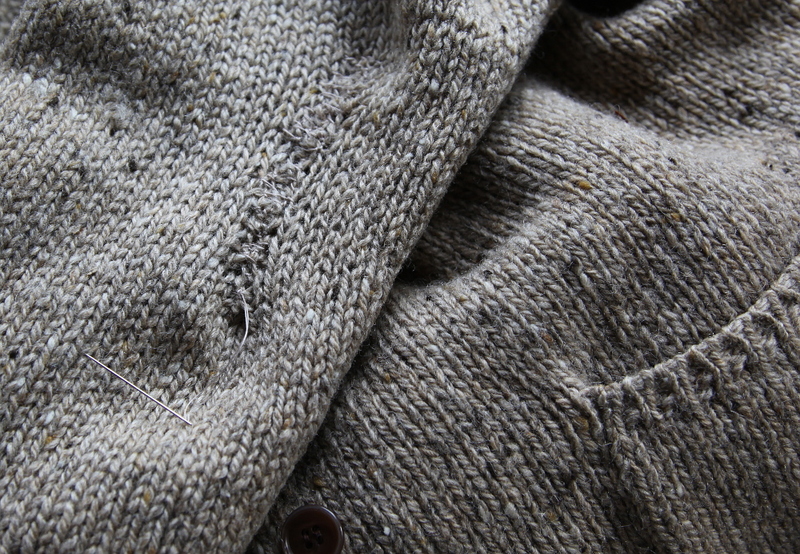 My work can be hard on my clothes, so I have a few designated “work sweaters.” This wool sweater, even though it’s ill fitting and really kind of frumpy, tends to be my favorite. 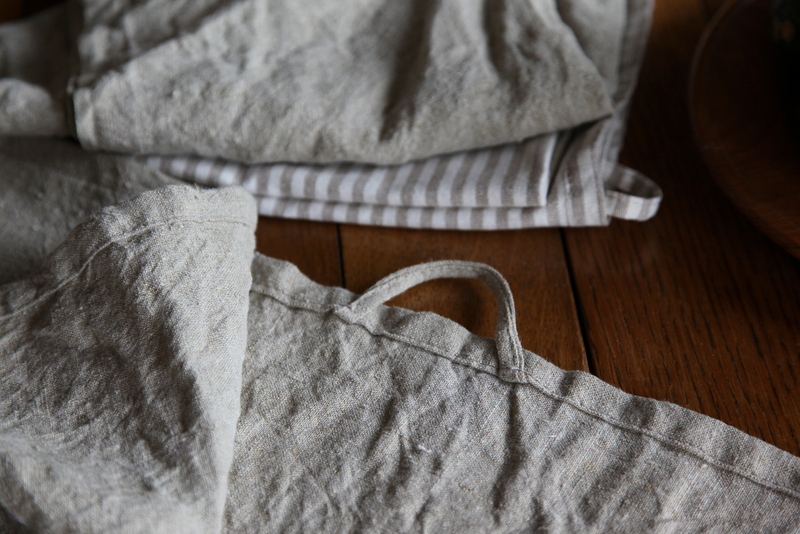 It’s loose and warm and easy to toss off and on throughout the day. 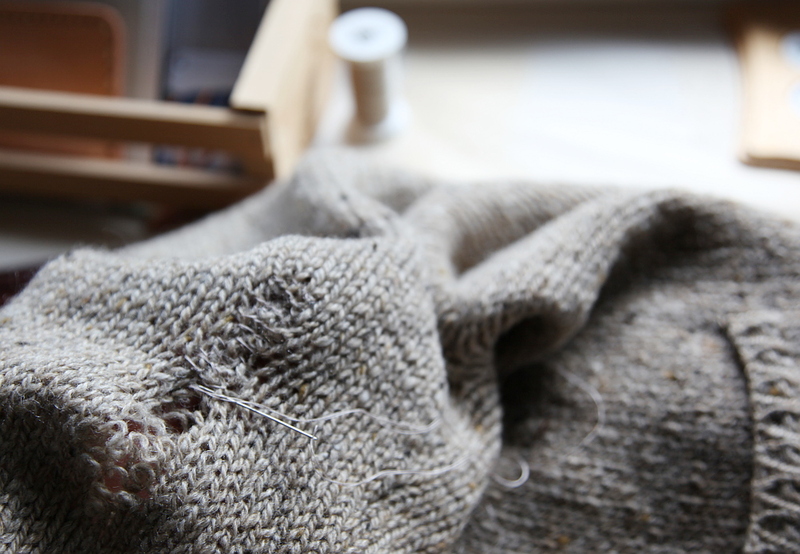 Before patching, I sewed the hole up, loosely but securely, so it wouldn’t continue to unravel. I almost could have called it done at this point, but that fix is not nearly as fun or lasting as patching. 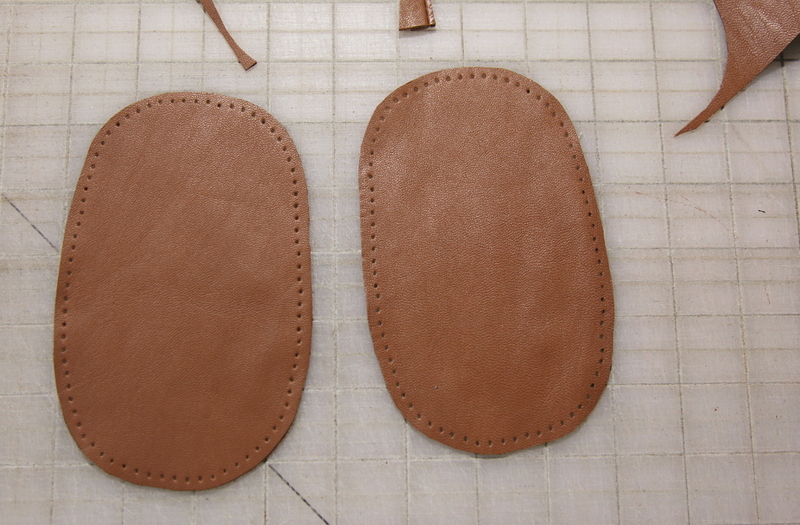 I made a patch pattern to my desired shape and size, and then cut 2 patches from an old leather skirt. Then I marked out and punched my stitch holes. The location of the hole was the perfect reference for where to place the patch. 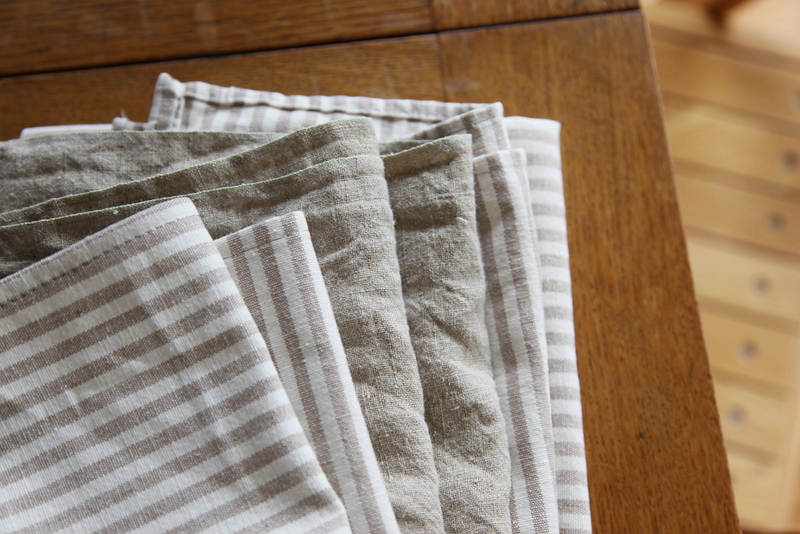 For the other sleeve, I matched it to the first by measuring, and then eyeballing it into position. I think that now it’s better than new! 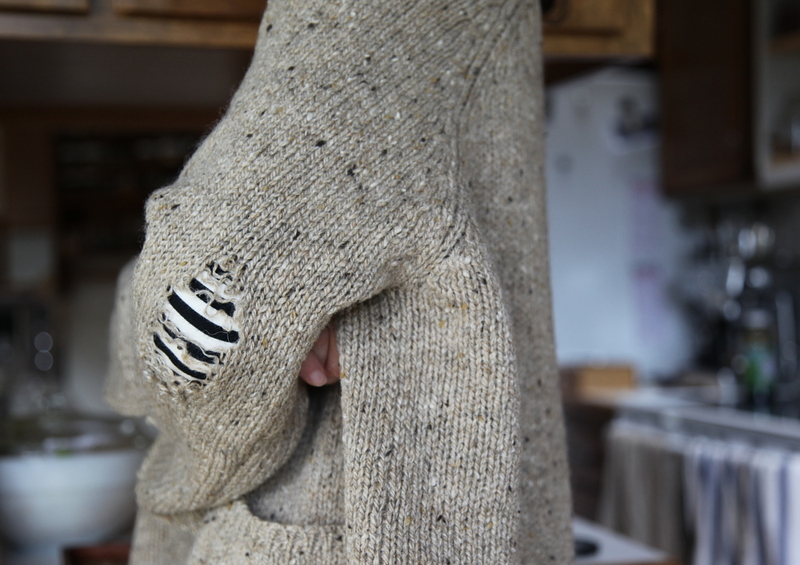 I also like to think my sweater even looks a little less frumpy now. 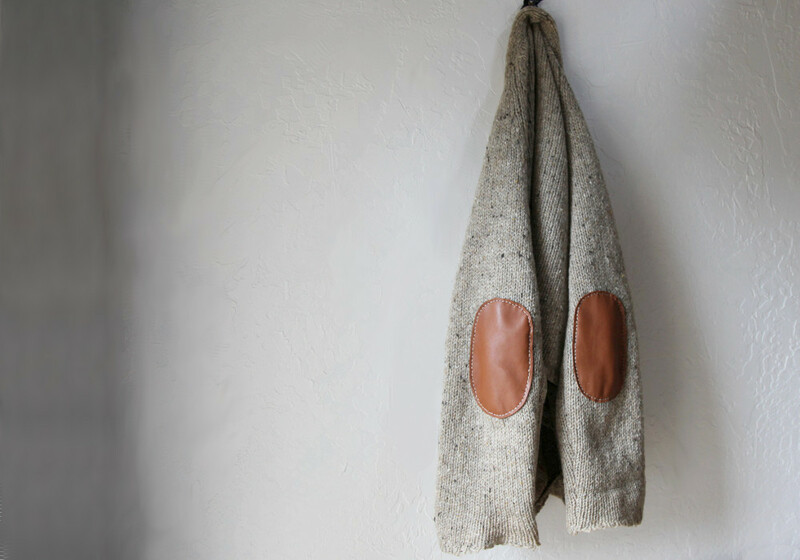 Are you a fan of elbow patches? I love how this look has made a comeback in recent years. 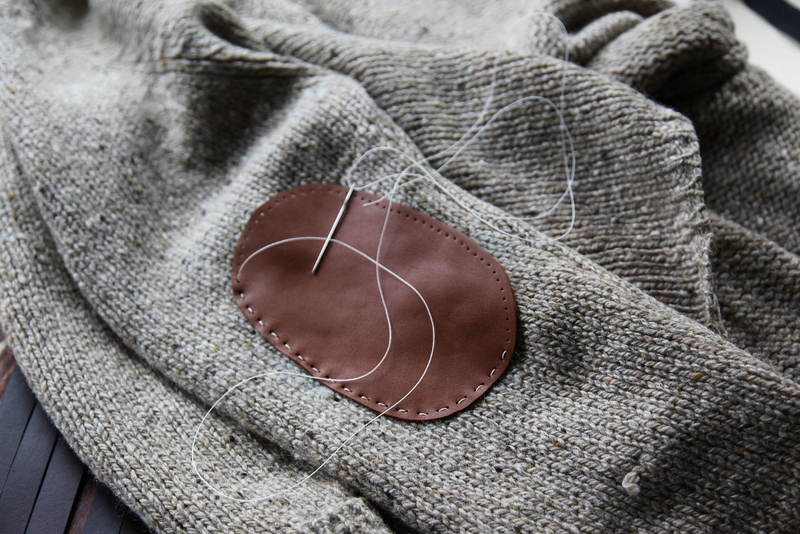 More patches from the past – tweed on cashmere. Are you a details kind of person? I tend to notice little details. When we got this duvet cover (during our virgin Ikea voyage last October), the blue, fabric-covered, metal buttons were a detail that bugged me. I don’t know why. They seemed chintzy. A few days ago I had this sudden, unstoppable urge to finally change those buttons out. I love the simple change. Plus, I am just crazy about wood. It is so warm and approachable. It’s fun to make something your own by adding your own personal touch. Do you do little things like this? 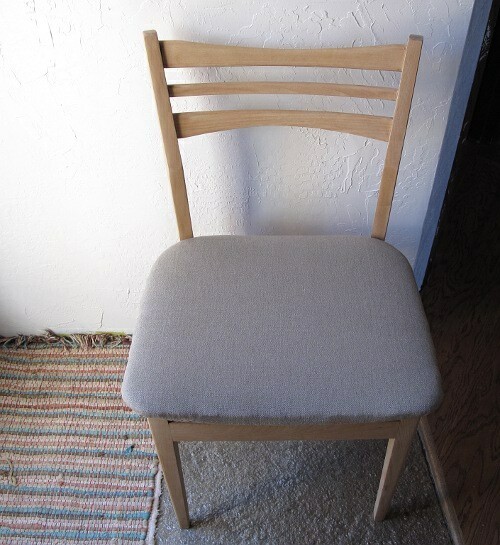 I’ve been interested in trying my hand at re-upholstery for a while now. 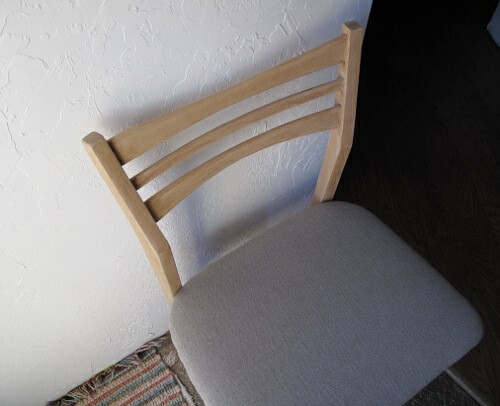 A few weeks ago I found a great little chair at the thrift store, with a solid wood frame, and a simple design I really liked. 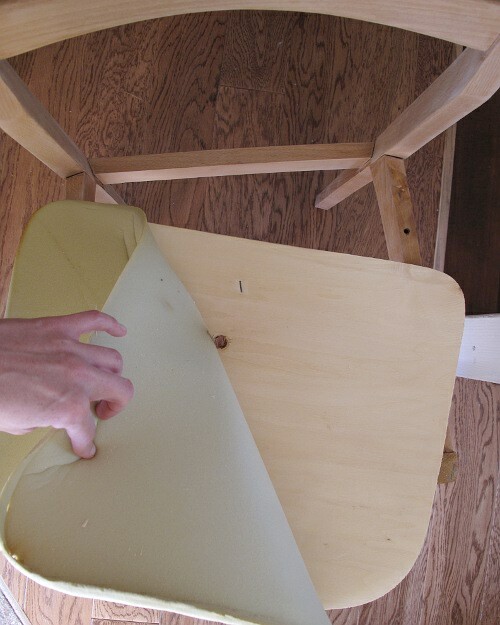 It was in rough shape, with water stains everywhere, and the vinyl seat was torn and worn. BUT it was only 3 bucks and it was quite solid. It seemed like it had a lot of potential and like the perfect begginer project. 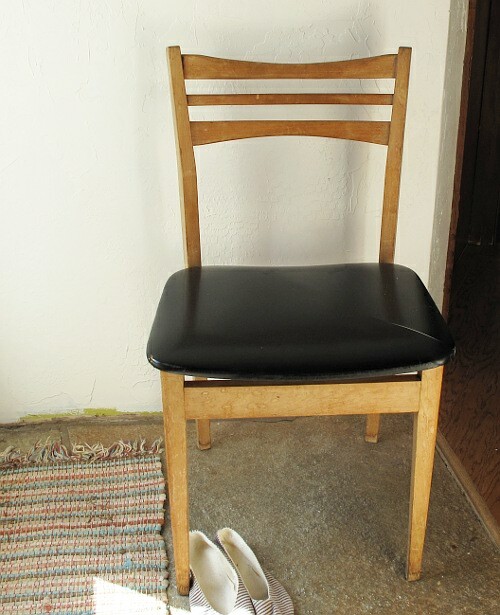 I have taken this chair from a funky vintage leftover that was ditched in the rain, to a Danish Modern beauty… for almost free. Here’s my process. It really was very simple, and so satisfying! and sanding and sanding… this part definitely took the longest (and this type of sander is probably not ideal for this type of job). 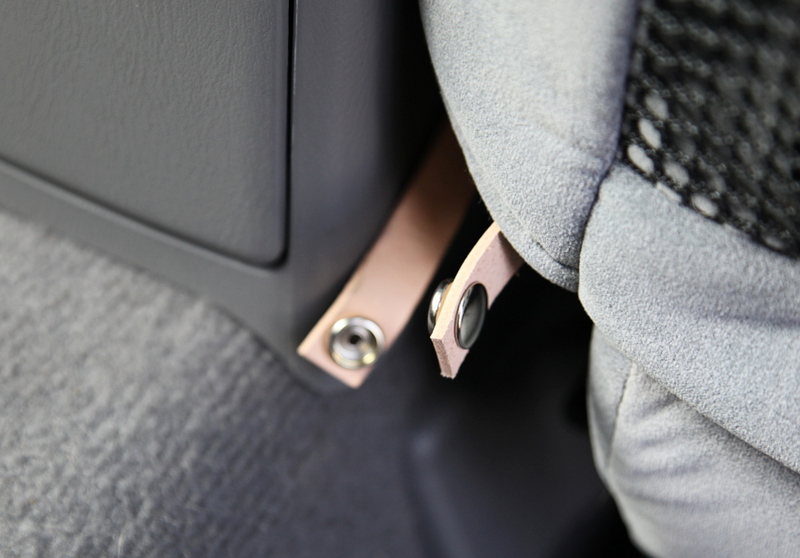 I then returned to the seat and removed all the staples fastening the vinyl cover. 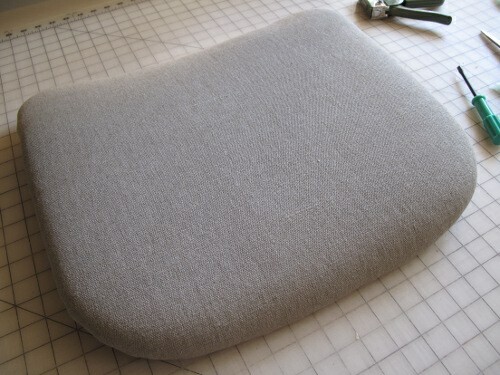 The foam pad was in fair shape, but if I’d had some wool batting on hand, I would definitely have replaced it. Then I cut a new cover. 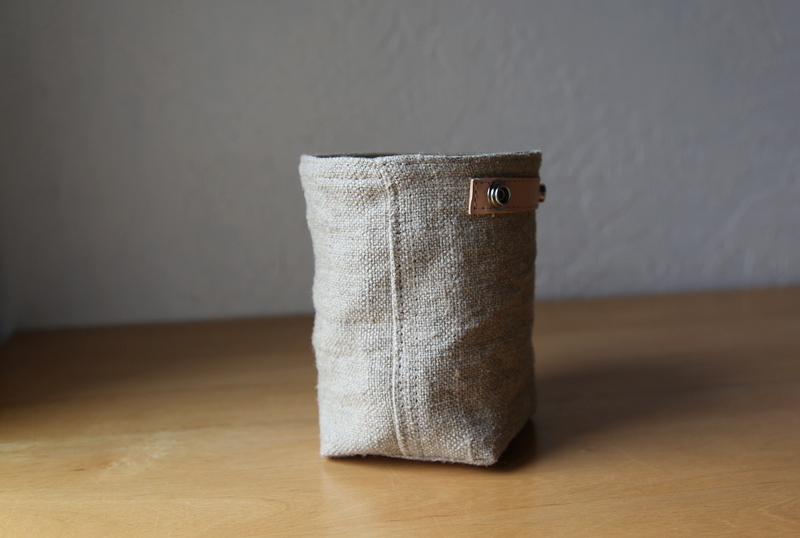 I used hemp canvas. 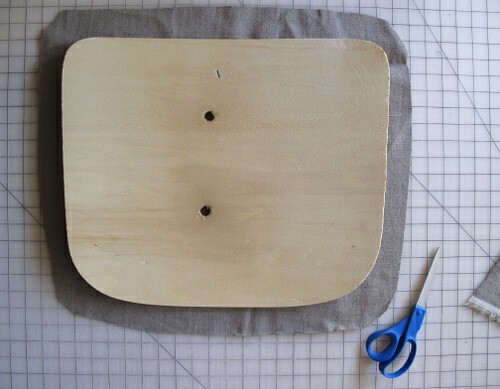 I traced the shape of the seat onto the fabric with a pencil, then included a couple extra inches for wrapping. 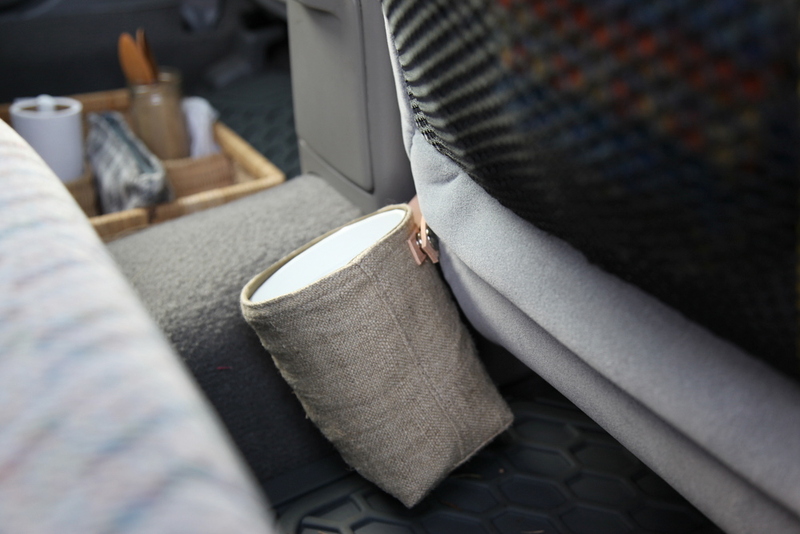 Be sure to leave enough to fit around your cover and around the edge of the seat. 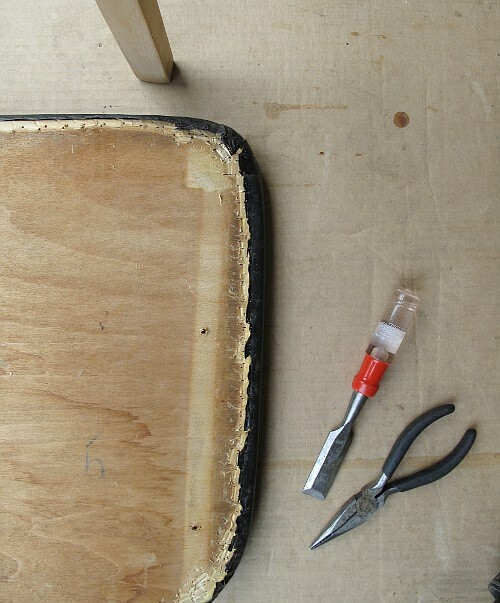 More is better than less as you can cut any excess off when you are done. 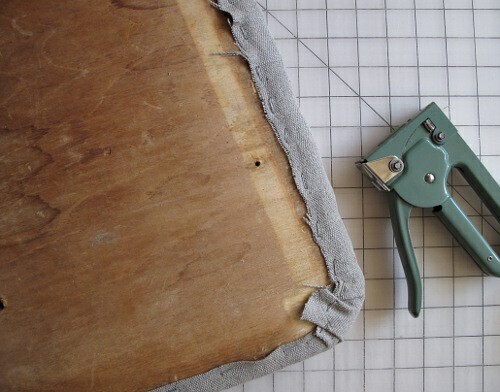 Staple all the way around, making sure to pull the fabric tightly, for a smooth, taut finish. The final step, which I have yet to complete, will be to refinish it. I am thinking Tung oil or perhaps making my own finish of a beeswax/walnut oil blend. 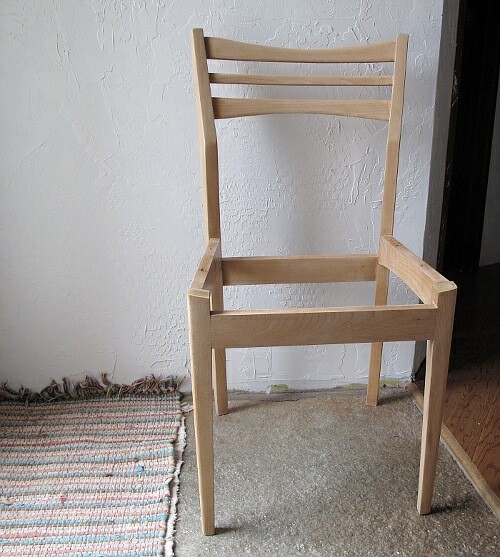 I would definitely do another of these projects, and knowing how easy it is has opened my eyes to furniture I might have otherwise overlooked. 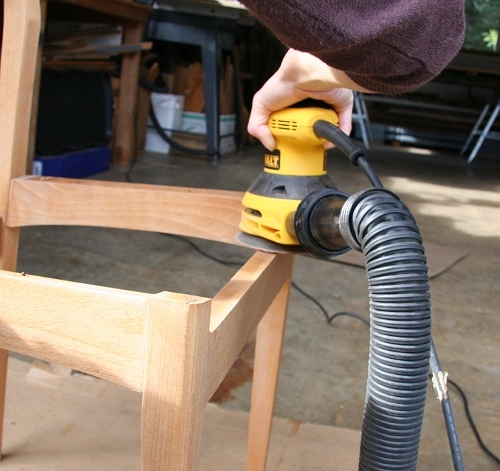 Things that need a little love and care, are usually priced in your favor, and in the end you have a unique piece of furniture done the way you like it.